The cartoon series in Urdu will begin airing on Pakistan's most-watched GeoTV channel in August this year. It has been conceived by one of Pakistan's best-known pop stars, Aaron Haroon Rashid to emphasize the importance of girls’ education and teach children other lessons, such as tolerance and concern for the environment. It appears that the series is inspired by the story of Malala Yousufzai, a Pakistan teenage school-girl who miraculously survived an assassination attempt by the Taliban in Swat valley last year. Malala has since become an international icon for girls' education worldwide. The United Nations declared Malala's 16th birthday this year on July 12 as Malala Day to focus on girls' education. Responding to a question about the choice of burqa, Rashid said “It’s not a sign of oppression. She is using the burka to hide her identity like other superheroes". “Since she is a woman, we could have dressed her up like Catwoman or Wonder Woman, but that probably wouldn’t have worked in Pakistan,” Rashid added. The series is set in Halwapur, a fictional town nestled in the soaring mountains and verdant valleys of northern Pakistan, according to The Associated Press. 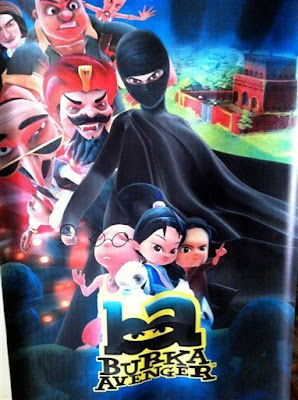 The Burka Avenger’s real identity is Jiya, whose father, Kabbadi Jan, taught her karate which she uses to defeat her enemies. When not dressed as her alter ego, Jiya does not don a burqa, or even a headscarf to cover her hair. The main villains are Vadero Pajero, a balding, corrupt politician who wears a dollar sign-shaped gold medallion around his neck, and Baba Bandook, an evil man with a bushy black beard and mustache who is drawn to resemble a Taliban commander. Caught in the crossfire are the show’s main child characters: Ashu and her twin brother Immu and their best friend Mooli, who loves munching on radishes alongside his pet goat, Golu. Other major stars featured in Burka Avenger series include Ali Zafar, Ali Azmat and Josh band members. Like other series featuring major superheros, the series will be promoted through mobile apps, video games, music videos and other merchandise in Pakistan. The series is an indication that Pakistan's mass media are getting serious about major issues confronting the country. It is a very timely effort to address two major issues Pakistan faces: Girls education and terrorism. The two issue are intertwined because the Taliban terrorists are among the biggest obstacles to educating girls in Pakistan, particularly in the nation's north western region infested by the Taliban. Series such as these have the potential to bring about a social revolution in Pakistan. ...but then I saw that the article was a little out of date and my gloomy mood returned. Sigh. Wouldn't it have been nice if this was our CURRENT story? The time is ripe in Pakistan for the series’ debut. Thanks to the courageous real-life story of education crusader Malala Yousafzai, a 16-year-old Pakistani girl who was shot by the Taliban in northern Pakistan’s Swat valley last October, girls’ education in the country has received urgent global attention in recent months. With the arrival of Burka Avenger, Malala will no longer fight her battle alone. And in this battle those fighting on the side of education need all of the recruits they can get. Last year alone, some 3,600 attacks were carried out against educational institutions. And in developing countries, the number of children who are not enrolled in school surged from 42 to 50 percent since 2008. In Pakistan, nearly half of all children and three-quarters of young girls do not attend primary school. Despite the bad news, there are signs that things are starting to change. For one, Malala has the world’s attention. But more importantly, her message seems to be reaching ears in Pakistan. While the Taliban has attacked 750 schools since 2008 in Malala’s home province of Khyber Pakhtunkhwa, 611 of them have been rebuilt. Further, education spending is on the rise, having grown by 27 percent to $660 million. In a parallel development, Pakistani comic book publisher Kachee Goliyan has also recently gained a significant following in a market that has struggled to find its groove. The stories and motifs in these comics – compared favorably with works by Marvel and DC – likewise take on a strong local flavor and are created by a young, progressive minded local team. The first Pakistani comics company and now the first Pakistani-produced animated series – both with local characteristics and a progressive bent: could this be a sign of greater things to come? Pakistan's Burka Avenger female superhero reflects shifting ground realities with increasing women participation in the affairs of the nation. 1. First women paratroopers inducted in Pakistan Army. 2. First female combat pilot commissioned in Pakistan Air Force. 3. First female jirga held in Pakistan. 4. Malala Yousufzai emerges as an international icon for girls' education in Pakistan and elsewhere. 5. Increasing number of court marriages by young couples in defiance of tradition of marriages arranged by parents. 6. Rising female participation in Pakistan's work force. The video clips from the animated series have gone viral over social media even before any official promotional work has been done by Unicorn Black, Aaron Rashid's own production house. The entire series has been developed in just over a year by a 22-member production team operating out of a small office in Islamabad. Music videos are also being released featuring some of Pakistan's top musicians like Ali Azmat, Josh and Ali Zafar. T-shirts and other merchandise will also be put on sale, aiming to launch Burka Avenger as a Pakistani superhero brand. Aaron Rashid says the theme will not only centre around the girls' school but will also teach children about the values of tolerance, equality and other social issues in Pakistani society. He emphasises that the central theme is non-violence, arguing that the main protagonist uses books and pens to thwart her enemies even though she hits people with them. Is the symbolism too complex for small children to understand? "She's saying the pen is mightier than the sword," he insists. "She is non-violent because she's throwing books. Most people throw bombs. Think about it." The Centre for Pakistan and Gulf Studies (CPGS), Islamabad, has recently launched a mega project titled ‘SALAM: Innovating Means to Resolve Radical Extremism in Pakistan’. The aim of the project is to introduce measures for the large-scale de-radicalisation initiatives in Pakistan by suggesting viable policy options to all stakeholders. The project is particularly focused on devising non-military tools (soft power) to fight this menace. It will be carried out in three phases. In the first phase of the project, a research study has been launched to trace the underlying causes of radicalisation and extremism in Pakistani society. Certain social domains have been identified as possessing the greatest potential for giving rise to extremist or radical tendencies, such as religion, ideology, economic deprivation, communal apartheid, psychological, sociological and international realpolitik. CPGS President Senator Sehar Kamran, while addressing journalists, said that these domains are under the introspection of various national and international scholars, who are conducting objective research on these topics for the Centre. She said an international seminar will also be held on August 21 and 22, 2013, to bring together the entire social fabric of Pakistani society, including the policy makers, academics, and civil society members and begin the process of sensitising the community on the subject. The Centre will also work as a mediator, and conduct interactive scenario workshops and roundtables between national and international experts to formulate a cohesive national response. This response will be refined and enriched by international experience and expertise, to root out the menace of extremism and radicalisation from Pakistan. At the tail-end of the project, the Centre aims to establish a model institute, hopefully in the vicinity of the Islamabad, where findings from the research and discourse phases of the project will be incorporated into a comprehensive programme, aimed at reintegrating the remote radical elements of the community back into mainstream society. This will be done via the provision of basic, balanced social, technical, religious education and a programme for socio-psychological reintegration. Furthermore, a social media campaign will also be launched with the help of national and international media to enhance awareness and understanding about Pakistani society both in Pakistan and abroad, in particular about the menace of extremism, which is nibbling away at the basis of our cohesion and integrity as a society. Finally, the Centre hopes to devise a holistic and comprehensive strategy paper with viable policy options and necessary legislative measures that may be incorporated into the national constitution, to effectively counter the problem at the national level. This all-encompassing report will be presented to all governmental institutions concerned for necessary action. Sehar Kamran said the vision of CPGS is to contribute towards regional and international peace, harmony and security through sustainable intellectual discourse, on all matters having an impact on the lives of inhabitants of this region and the world at large. Its objective is to encourage discussion among national leaders, intellectuals and academicians to accelerate social, political and economic development, for the benefit of the people of Pakistan and the Gulf region. We think Disney could learn a thing or two about what a female protagonist should look like from the fearless Burka Avenger. 1. She fights villains with Takht Kabaddi -- a form of karate that uses books and pens as weapons, because she's all about emphasizing the importance of education. To her, books are more than a prop to dance with. 2. By day, she's Jiya, the reserved school teacher -- but when bad guys come around, she dons a burka to conceal her identity and saves the day. And unlike Mulan, her alter ego is still proudly feminine. So she's a little too busy to become enamored by her own reflection. 4. Her sidekicks are three adorable kids, and she's constantly saving and inspiring them..
.. Instead of the other way around. 5. Her burka is a source of power, not oppression. She can even use it to fly. So she doesn't need a man to sweep her off her feet. 6. She's fighting bad guys that actually exist in the real world -- corrupt politicians and vengeful mercenaries who are limiting access to education. Which makes evil witches and mean stepsisters look like a cakewalk. "Don't mess with the lady in black, when she's on the attack." The series is set to premiere in early August. The man behind Burka Avenger, pop star Haroon Rashid, said he had been overwhelmed by the response. A TV distribution company in Europe has been in touch with a view to translating the show into 18 languages, including English and French, and screening it in 60 countries, Rashid said. The issue of girls’ education in conservative, militant-plagued north-west Pakistan hit world headlines last October when Taliban gunmen shot teenage activist Malala Yousafzai. Malala, who campaigns for the right of girls to go to school, survived the attack and last month delivered a powerful speech at the UN in New York. Rashid said Malala was a “real life superhero” for her courage and said the attack on her had come as they prepared an early episode of Burka Avenger. ...Much of the initial controversy surrounding the show centred on the character’s choice of cloak, but critics of the use of the burka entirely missed the point. Oppression does not arise from covering the body or the face of a person, oppression is failing to give the person a choice. Jiya, chooses to don the burka and it becomes a tool of empowerment. Who are we to say that her attire marginalises the Burka Avenger if she wears it to feel strong and to conceal her identity? However, critics have suggested that a less negatively perceived attire or more traditional superhero garb would have sufficed. As they suggest, alternative clothing would remove the potential for negative traditional stereotypes that are often associated with the burka. However, those that would rather have the Burka Avenger wear less controversial or more modern attire are as oppressive as those that force women to wear the burka in the first place because they too impose their set of values upon another without offering even the semblance of a choice. The burka controversy has also overshadowed other positive aspects of the cartoon, including its pure entertainment value. Jiya herself is also a role model for young children and females especially. She is both an adopted child and a schoolteacher by profession. While her attire as the Burka Avenger may be traditional, her background and choice to pursue a career are decidedly not. This show does not depict its hero as a typical Pakistani female character, simpering or conniving and eternally caught in a struggle to maintain her home or her marriage. She represents an alternative and equally important female avatar: the workingwoman. It is also important to determine whether the show fulfils its purpose. To assess this, its purpose must be determined. If the purpose of Burka Avenger is to stave off further international criticism from the events surrounding the attempted assassination by the Taliban of Malala Yousafzai, then the show is successful. As soon as the trailer for the Burka Avenger was released, the international news media and social networks were abuzz with positive comments and appreciative reviews of this new superhero set to join the likes of Wonder Woman. Reputation is an important tool for determining the nature of international relations. The better a state’s reputation, the more it may be able to gain and the more it may stand to lose. Pakistan gets to add a few positive points to its reputation because Burka Avenger is widely applauded for its attempt to break stereotypes and empower disenfranchised children (especially girls) to fight for their right to an education. All in all, Burka Avenger is a wonderfully positive publicity tool internally and externally for Pakistan, but its success lies solely within the entertainment it provides as a cartoon, the positive role model it displays in both Jiya and the Avenger and the civic education it delivers as part of a movement to acquaint Pakistanis with their rights. Burka Avenger is not a mechanism for solving the greater issues because socially conscious messages delivered through entertainment mediums are not as intimidating as the books and pens that the Avenger throws to defeat the villain and save the day. This means that ultimately, enforcing fundamental rights, such as the right to have access to education, requires a concerted effort from all facets of society. This effort will ideally change the perception of education in Pakistan from its current stance as a luxury to a future where it is wholly considered a necessity. In that future Pakistan’s burka-clad superhero will be avenged. The University of Georgia's Grady College of Journalism and Mass Communication announced on Wednesday that Pakistan's "Burka Avenger," an animated television show about a burka-clad schoolteacher who fights local thugs seeking to shut down the girls' school where she works, will receive one of the 2013 Peabody Awards (Dawn). The Urdu-language show, which airs on Geo TV, emphasizes the importance of girls' education and other lessons, such as not discriminating against others. The awards, some of the most prestigious prizes in broadcasting, recognize "excellence and meritorious work by radio and television stations, networks, webcasters, producing organizations, and individuals" on an annual basis, and will be handed out at an awards ceremony in New York City on May 19. Pakistan’s first full-length animated feature 3 Bahadur has become the highest grossing animated-film ever to release in Pakistan. It is truly an exciting time for Pakistani cinema. Over the course of the last year and a half, Pakistani filmmakers have treaded into new and untested waters and unsurprisingly all of them have managed to wow the audience. First there was Bilal Lashari’s action-thriller Waar, then Nabeel Qureshi’s game-changing comedy Na Maloom Afraad and last but not the least Sharmeen Obaid-Chinoy’s animated movie 3 Bahadur. Billed as Pakistan’s first animated feature film, the movie is in the midst of a stellar run at the box office and has now become the highest-grossing animated movie in the history of Pakistani cinema. Previously the record was held by Blue Sky Studio’s Rio 2 which grossed an estimated Rs 4.5 crore but 3 Bahadur has comfortably managed to outdo the Hollywood movie after only three weeks with a box office collection of Rs 4.7 crore up till now. According to the executive producer of 3 Bahadur Jerjees Seja, the success of the film underlined the fact that Pakistani audiences want to ‘watch their own films’. “It is really great that a first ever Pakistani animated film has managed to outdo a major Hollywood franchise like Rio 2 in terms of box office,” said Jerjees. Released in over 35 cinemas the movie has managed to perform well at cinemas in both Punjab and Sindh, with each province contributing 50 per cent to the total box office collection. The film was not released in Khyber-Pakhtunkhwa and Balochistan. “Although the film did perform well in its first week it has picked up tremendously during the last two weeks,” said Khurram Gultasab, the general manager of the chain of Super Cinemas in Punjab. He identified ‘exams’ as a major reason behind the lesser turnout in the cinemas during the first week. Released during the highly crowded summer window the movie faced tough competition from other international releases with movies like Piku, Bombay Velvet, Tanu Weds Manu Returns and Avengers: Age of Ultron.